As local birding destinations go, among the most popular are the forest preserves scattered throughout Cook County. Dedicated birders, you might say, flock there to catch sight of native and migratory species year round. Through the three-year-old program called Bird the Preserves, which receives funding from the Forest Preserve Foundation, everyone has an open invitation to bird watch. Judy Pollock, a Chicago-area bird conservation consultant to Bird the Preserves, said the program has three goals: (1) strengthen the Forest Preserves relationship with existing bird organizations, (2) solidify the position of the Forest Preserves as a good birding destination, and (3) reach out and engage new audiences in the forest preserves through birding. 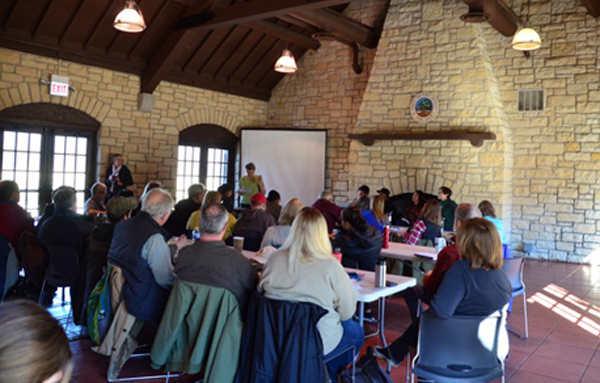 Efforts toward the third goal got a boost in late January, when the Foundation and the Forest Preserves of Cook County presented a workshop titled “Broadening the Base: Community Outreach and Engagement for Birding and Stewardship Groups” at the Thatcher Woods Pavilion in River Forest. They shared their knowledge and advice on community networking, making use of technology/social media, publicizing events to specific communities and attracting diverse audiences. Marshall, a doctoral student in ecology at the University of Illinois-Chicago, gave a short talk titled “What Does a Culturally Connected Conservation Look Like for Cook County?” She discussed how working with communities in which a person is not a member requires as acknowledgement of intentions. She guided the audience of about 50 through a self-reflection exercise designed to get at what motivates people to support environmental causes and communities to which they don’t belong. “We often see communities and perceive their needs, but when building relationships it is so important to see yourself as a part of the community,” Marshall said. 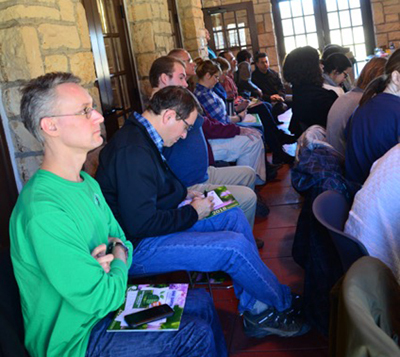 Avid birders from across the region attended the workshop. The response to the workshop was actually better than expected, Pollock said. Nearly 50 people attended. The Forest Preserves started Bird the Preserves with funding from the U.S. Fish and Wildlife Service and the Foundation stepped in.